The architectural office "Peter Stasek Architects - Corporate Architecture" comprise an international team of architects, interior designers, lighting designers and artists in the greater Frankfurt area, Germany, Amsterdam and New York. The ultimate ambition of this team is the achievement of unmistakable architectural creations, which under the sign of corporate architecture are able to stengthen the client's firm profile (under fulfillment of all functional and technological requirements). The most important clients of Peter Stasek Architects, comprise multinational groups from the fields of new business developments, biotechnology and the lighting industry, operators of healthcare facilities, shops, shoppings malls and others. 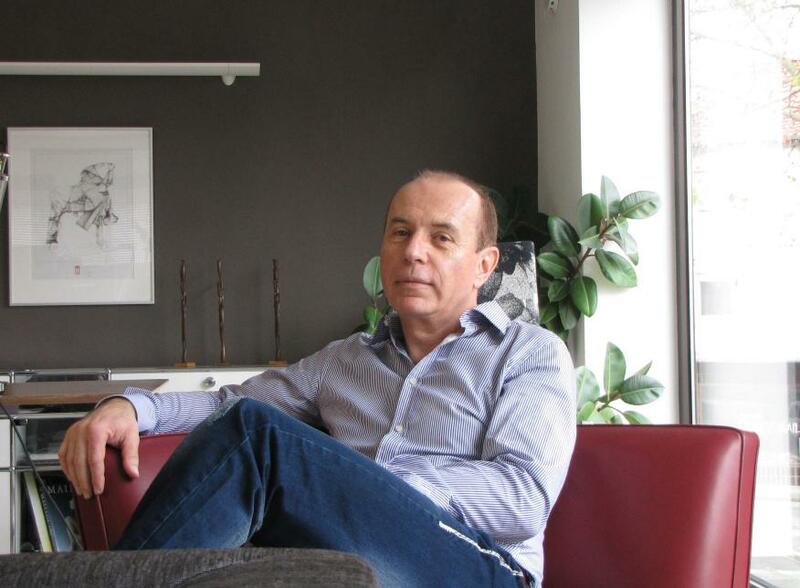 The architectural projects by Peter Stasek have globally been presentend on numerous architectural and design platforms and published by international publishing houses. Peter Stasek Architects is officially invited to participate at the Venice Architecture Biennale 2014, directed by Rem Koolhaas, which runs from 7 June until 23 November 2014. Photo above: Scale model for the main exhibition hall of The Light Design Centre Speyer. Hier werden die wichtigsten Ideen gezeigt: die fließende Galerieform mit der hängende Twister-Skulptur im zentralen Luftraum und die Theke aus verrostetem Stahl, welche nur einseitg befestigt ist und somit den Eindruk einer Sogwirkung des Twisters erwecken soll. the priority of the lighting objects to be exhibited. The Speyer Light Design Centre is acknowledged as the centre of light knowledge, applications and innovations, where both individuals, architects, designers and business consultants often go to get a professional lighting advice. 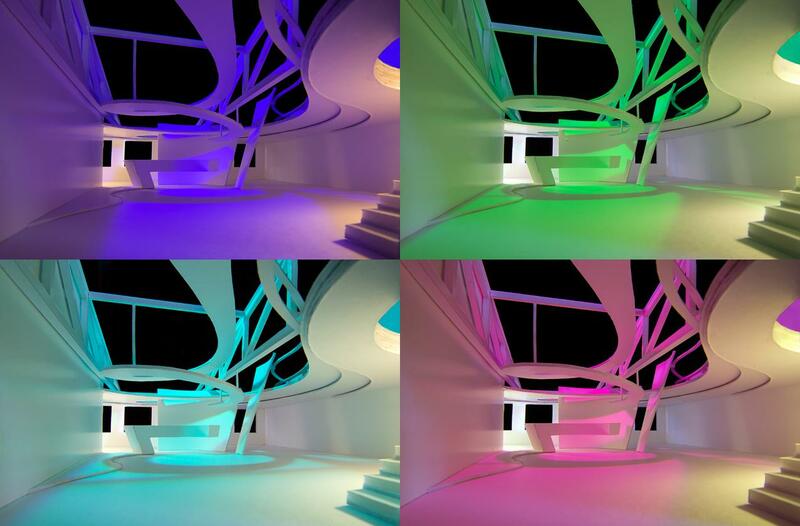 Lighting creates ambience, influences emotions and highlights architecture. 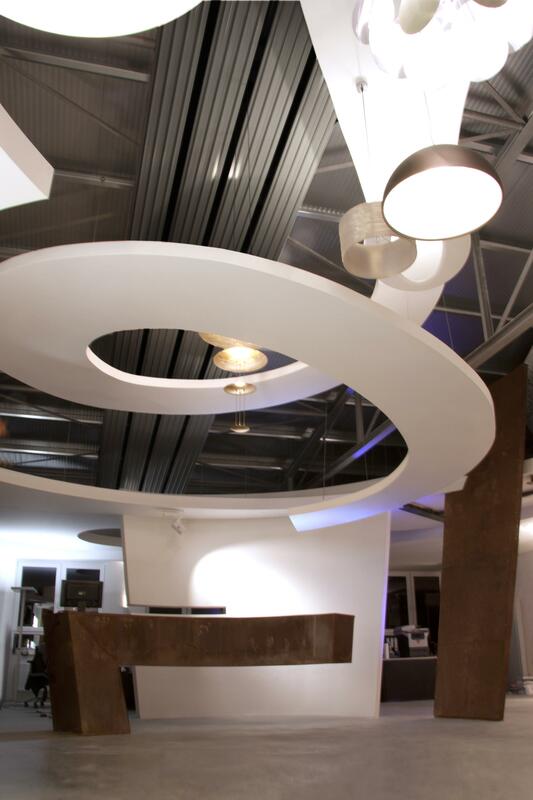 The Light Design Centre Speyer implements lighting concepts that communicate a feeling of well-being - individually coordinated nad perfectly tailored to the situationand wishes of its clients. Irrespective of whetherr thery are private persons looking for luminaires for thier houseor flat or whether they are architects searching for consultation in lighting solutions. It is also a well-known meeting point fopr leading international manufacturers, who come to Speyer either to attend interesting lectures, or to get the advice thery need. At the Light Desdign Centre Speyer the consultants plan and visualise all imaginable indoor and outdoor application areas with state-of-the-art software tools right down to photorealistic simulation. 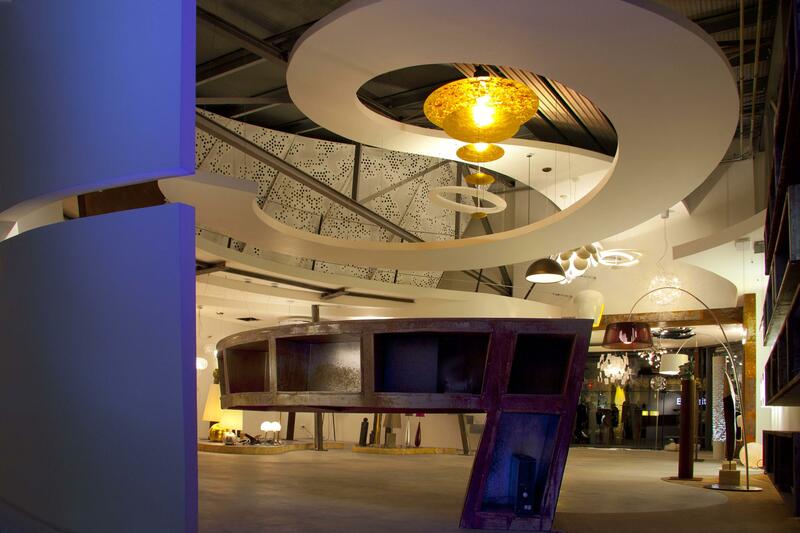 Photo left: Hauptausstellungsraum des Lichtcenters, mit Theke und Twister. Oberhalb der Theke beginnt die Kurve des Twisters. Gesamtlänge des Twisters beträgt 22 Meter. The design of the Peter Stasek Team won the bronze A'Design Award, an international competition for designers, innovators and companies, in Italy (Como). Aus einen der anspruchsvollsten Innenausbauteilen innerhalb des Projektes Lichtcenter Speyer, wurden vom Anfang an die Ausbildung des Twisters angesehen, einer im zentralen Luftraum freihängenden Skulptur in Spiralform. Für die Befestigung dieser Skulptur wurde in der Zusammenarbeit zxwischen dem Architekt und der ausführende Firma eine Sonderlösung entwickelt. Die Aufhänguing besteht somit aus verstärkten Wasserleitungsrohren, welche zwischen den CD Profilen duirchgehend platziert sind. Auf diese Art bleibt die Aufhängung innerhalb der tragende Konstruktion beweglich. The twister is measnt to be a kind of natural phenomenon with invislbe forces, which make nearly eveything float and which, at the same time, cause new aesthetics for spiral sailing. The maelstrom of the twister, a polarizing form, magically draws the visitor to the middle of the exhibition and makes him, together with all the high-end light objects, completely forget the existing gravity. 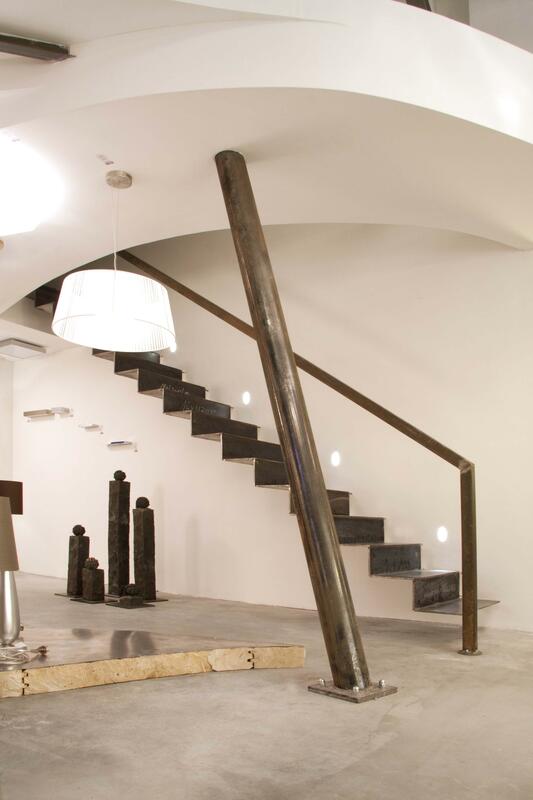 The orgasnically shaped 3D twister sculpture, which is floating in the air, marks the centre of the showroom together with the reception desk made from rusted steel. Both adapt themselves to the spiral upwards movement of the twister. The mergence of the colour and light concept is an other characteristic feature of the interior design of the Light Centre Speyer. The entire colour range of the floor coverings, walls, ceilings and the furniture is based on the utilisation of non-colours. Only shades of white, anthracite and gray were applied enabling all colour accents within the showroom to be generated only by the light itself or by the surface design of the light objects. The main lighting manufacturers and designers represented at the Speyer Lighting Centre are: Artemide, Nimbus, Occhio, Delta Light, Tobias Grau, Molto Luce, Ingo Maurer, Serien-Lighting, Agua Creation, Catellani & Smith, Vibia and Florian Schultz.